Inch of Creativity: White Christmas. Well... it's definitely white out there! In a blink of an eye and it's winter! One minute I'm kicking through leaves and now I'm shovelling snow! My boys love it... me... not so much. Today's card uses the ever adorable stamp set: White Christmas. Have you got this one yet? If you haven't, you really should, trust me, you will not be disappointed with it! Today's card is one I created for a demo class event that my friend Marja and I held in October. 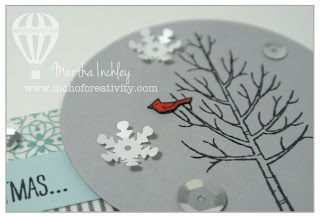 For each of my projects, I tried to incorporate the Whisper White cardstock and Soft Sky snow. My curvy keepsake box post was apart of this class and as you saw, it also had the snow on it. This card is fairly simple. I used All is Calm washi tape, Whisper White, Soft Sky and Smokey Slate cardstock and the frosted sequins. I love how the little red cardinal is the focal point of my the card. I stamped him on a separate piece of card stock and cut him out. I then edged him with my basic black marker and placed him in the tree. Thanks for stopping by and Happy Creating as always! Stay warm!